To get international producers’ perspectives on the role of publishing in the children’s TV business, VideoAge contacted animation companies in Canada, Germany, and Italy. VideoAge spoke with Kristin Lecour, vice president, Consumer Products, 9 Story Brands, and Hayley Solman, development executive, 9 Story Media Group (who shared their comments), Peter Kleinschmidt, international commercial director of Studio 100, and Valentina La Macchia, licensing director of Mondo TV Group. VideoAge: When is it strategically important to publish? 9 Story: While historically we have tended to launch publishing programs after our series are up and running, we are currently working on a property that we feel might benefit from launching a few books prior to content. Every scenario is different and we make sure that we are not following any sort of formula, but are doing what is best for each brand. Valentina La Macchia: We only collaborate with publishers who are both committed to our brands and who can guarantee that there will be product availability alongside the TV launch. We believe it’s essential to ensure that books are on sale while the series is on air. That said, books might sometimes appear before the broadcast date, if, say, the content is educational or the editorial content is interesting in itself and only indirectly related to the show. Peter Kleinschmidt: Publishing at the same time as the broadcast launch, or within a certain time range, is better for both the show and the books. In general, products that transport or extend the content of the show towards the target group support the broadcast and enable kids to delve deeper into the stories while identifying with the characters. Thus, the brand can grow steadily, and at a later stage, other products from various licensing categories can follow. We always strive to find the best publishing partner for our brands during the development and production phase, to reach a maximum of synergies and plan the timing for a perfect launch. VA: When is it better that the book reflects the script, and when should it only take inspiration? 9S: We evaluate this on a case-by-case basis as each property offers a unique set of opportunities. We review the source material and determine what will be the most engaging way to bring these characters and their worlds to a new medium. Oftentimes, we set out to retain the evergreen qualities of the books in our television series. We want our series to have longevity and determine what qualities make the books classic and compelling, while simultaneously determining what needs to be “refreshed.” Since storytelling takes a very different shape for television, we will rework the book stories to work for the medium. VLM: We only invest in the production of a TV series if it offers engaging storytelling that would be suitable for publishing companies. In most cases comedy and adventure are the ideal ingredients for ensuring that a property can succeed in editorial terms. PK: This depends on the kind of book. If it is only retelling the story of the TV show, being directly adapted from it, it should stick to the script in order to not confuse the readers/viewers. But you can create spin-off books, publish additional stories that deepen the experience for the kids. New stories that are not shown on TV bind the target group more strongly to your brand. VA: Is publishing a profit center or just a marketing tool? 9S: In our experience, publishing is a significant source of revenue for our brands globally. We view publishing as a critical pillar in the development of a consumer products program, especially in the younger demos. It also allows us to dig into themes and storylines not always explored in the series, such as the backgrounds of characters, or the origin story. VLM: Publishing is a big driver for the licensing and merchandising programs of all our properties and a highly profitable category for Mondo’s licensing business in its own right. PK: It is both. First, publishing is a marketing tool to support the broadcast launch of a TV show, enabling kids to experience what they’ve seen again and again and thus adhere to the brand. Once the show is getting more successful, partly supported by the books, these can become bestsellers themselves and turn this licensing category into a true profit center. We have experienced this with our brand Mia and Me. The first book was published almost at the same time as the show was launched on TV. Now, six years later, we have 105 book titles and more than 1.8 million copies sold in the German-speaking territories. VA: Do you option children’s books for possible TV shows? 9S: Yes, we take great pride in our experience translating children’s books into television series. We have strong relationships with publishers, and are often able to preview book properties long before they are published. We’ve brought many classic book properties to television screens. We are honored when writers trust us with their characters. We also recognize the intimate built-in relationships our audience has with these book characters and we look to nurture and grow those relationships by telling new and engaging stories. It is an exciting challenge that inspires us as producers. VLM: The inspiration for our live-action show Heidi Bienvenida comes from the classic novel, Heidi, written by Johanna Spyri, although it has been brought up to date. As a matter of interest, the publishing category for Heidi Bienvenida is important, as the appeal of the Heidi story — the tale of a girl from the mountains who moves to the big city — is a proven one. 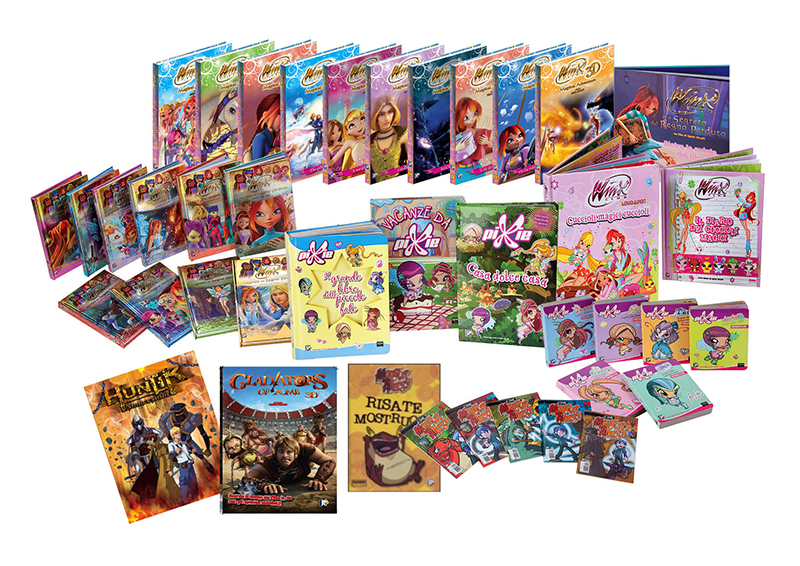 The combination of the classic tale and a very original and up-to-date adaptation has been a winner with publishing groups and allowed us to cover many publishing styles, including sticker books, storybooks, puzzle books, magazines, singalong books, arts and craft books, and fan guides. PK: Our production teams always have an eye on children’s books. But you must evaluate extremely carefully to determine if the stories can be turned into a TV show. And while doing it, you need a lot of dedication to stay true to the books. We have done that lately with the preschool show Tip the Mouse, which has an enormous publishing heritage. More than 11 million books were sold worldwide, translated into 32 languages!